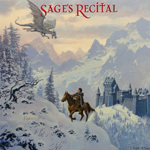 Sage's Recital is a band formed by Niels Vejlyt (Infinity Overture) that features the very talented John West (Royal Hunt, Artension, Artlantica) on vocals, and drummer Jakob Vand (Infinity Overture). They play a mix of neo-classical and symphonic power metal. Within the first ten seconds of The Power Within you can hear the amazing guitar playing of Vejlyt. I believe the first two words out of my mouth, were "Holy" and another four letter word that ended with the word "It." Sage's Recital: guitarist Niels Vejlyt. The recognizable voice of John West comes in just after the 30 second mark. He sounds amazing and consistent as he always does. This is a great power metal song, with classical flourishes of lead guitar throughout the song. You Hold The Key starts very similar to The Power Within. The verse features a much heavier riff than The Power Within. It also features a majestic chorus sung by West. Three minutes in, you find a very technical yet melodic solo, that shows that Vejlyt is a very diverse guitarist. Some may compare his style, to Yngwie Malmsteen, the difference here is that Veilyt's lead guitar work, fits the melody of the song. I don't believe he is playing to prove how fast he can play, or to be the next Pagannini on guitar. The Last Unicorn is next, an instrumental featuring Franck Hermanny of Adagio on bass guitar. Veilyt's amazing fret board pyrotechnics are on display throughout this song. This song is very much in the style of Michael Romeo of Symphony x. With Veilyt's sweeping/tapping guitar playing and solos that build upon a melody that appears earlier in the song. Council of Dragons intro definitely has a medieval feel to it. A very cool stop and go riff enters when the verse starts. West's voice soars over the music playing behind him. The song also features a very cool twin guitar melody by Vejlyt. This is probably my favorite song on the disc. Immortal Flame starts with a harpsichord and West's voice soaring over it. The first three minutes of this song is absolutely beautiful. Guitars and drums come blazing in, with a very melodic, almost prog-like interlude. The song also features Anne Karine Pripp (Infinity Overture) joining West on this song. At nearly nine and a half minutes, I could write a review just based on this song. The Dead of Winter is a nearly nine minute instrumental piece. This song has everything you would want from a neo-classical instrumental. From its sweeping guitar solos, to melodic leads where the guitar sounds like it could sustain the notes forever. The song follows a motif throughout, and Vejlyt keeps the song interesting throughout its duration. Finally we have The Last Battle, and what a battle it is. Clocking in at nearly fifteen minutes and thirty seconds, this song is epic. This is a song that everyone who likes this kind of music, should take the time to listen. 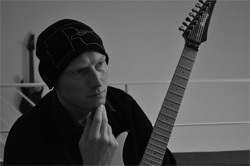 The intro features strings and orchestration with Vejlyt's guitar playing. This is a difficult song to review, due to the amount of time changes, melodies and the sheer amount of music that is here. No matter how I describe this song, it would not do it justice. To me this song is right up there with Symphony X's The Divine Wings of Tragedy or The Odyssey. When John West's melodic vocals come in, they are very enchanting and soulful. This is one of the best neoclassical-power metal cds I have listened to in a very long time. Vejlyt brings a sense of epic-ness, melody, and amazing guitar playing to a disc that is enjoyable from start to finish. Easily recommended to those who love neo-classical or symphonic power metal! Vejlyt brings a sense of epic-ness, melody, and amazing guitar playing to a disc that is enjoyable from start to finish.